Grilled cheese is a kid favorite. Many of us crave grilled cheese and tomato soup from time to time, especially when the weather gets chilly. However, the traditional processed American cheese on white bread grilled with tons of butter and a can of condensed tomato soup is nutritionally a bit….wimpy. But there is a way to pump up the muscles on this classic lunch. Start with kale (after all which veggie packs more punch than kale!) This is a great way to get greens into lunch using a familiar favorite. After stir frying the chopped kale to soften the texture and taste, incorporate it into your sandwich for a gooey, melty green, cheesy power sandwich. Serve on a hearty whole grain bread and serve with our Quick No Can Tomato Soup for a perfect comfort food lunch! Yum!! Remove large ribs from kale leaves and chop leaves finely. Heat about a teaspoon of oil in a large skillet. Add the kale and garlic and stir fry until soft over medium heat. Add salt to taste. Remove from the pan into a bowl or plate and divide roughly into 4 parts. Wipe the skillet clean with a paper towel and reduce heat to low. Assemble grilled cheese by placing one slice of cheese on one slice of bread. Spread one part of the kale mixture evenly over the cheese. Add another slice of cheese and spread another part of the kale mixture evenly. Place second slice of bread on top. 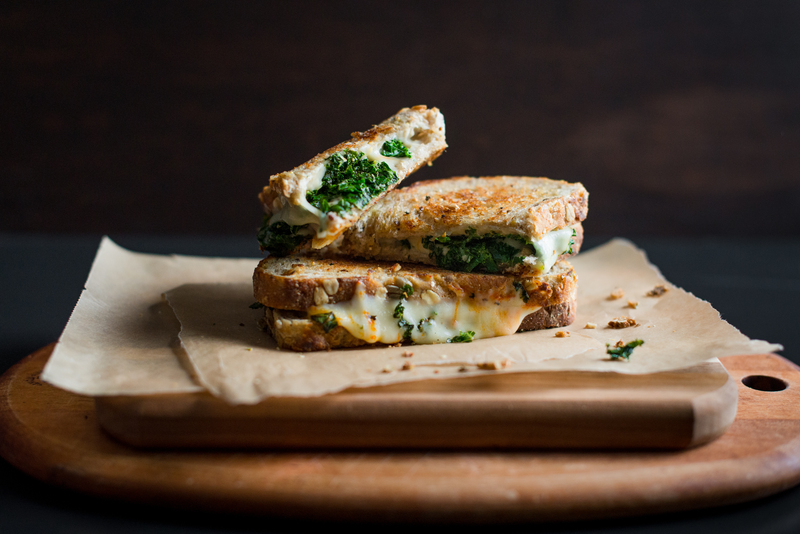 Assemble second grilled cheese using the same method with the remaining two parts of kale. Lightly butter the outside of the sandwich and place on the skillet to toast. Allow bread to brown lightly and cheese to melt. Flip over and toast the other side.